August is upon us and I am soooo thrilled. For me, August has always been a time for fresh starts, new beginnings and new shoes (I'm not in school anymore but I can't stop traditions... and who can say no to new shoes?). More than anything though, August brings on Fall, a season like no other. Crisp air, scarves, warm baking, turning leaves... and cozy PJs! Two weeks ago Amanda was in town so I toured her around to a couple of my LQSs. 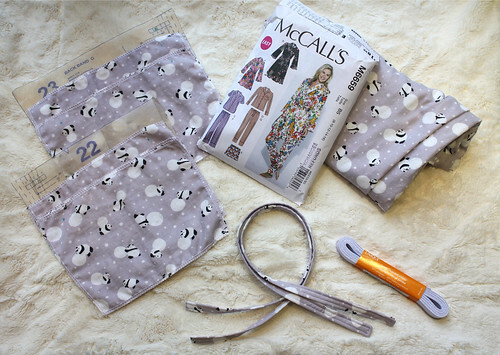 At the first stop, she swooned over a double gauze panda print by Cosmo and I couldn't stop myself from picking up some yardage too. What can I say, my cousin has a good eye and great taste. I started cutting while she was here but then lost steam. For fear that this may turn into another half completed garment project if I don't take drastic measure, I'm making this my August goal for A Lovely Year of Finishes. I can't wait to rock these little bears come September. Also linking up to WiP Wednesday over at Freshly Pieced. Fun!! I have to agree with you, it's easy to lose steam on projects like this, especially when you have to use tissue pattern pieces. Cute fabric! I really would love a pair of real PJs. Looking forward to seeing these when you are done! From A - Finally Finished!